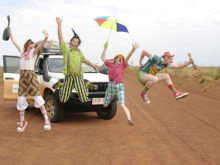 In 2012, Clowns Without Borders South Africa and Clowns Without Borders France joined their forces to do a HIV / AIDS and Literacy related project. 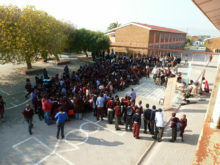 They performed 17 shows for 7000 people. 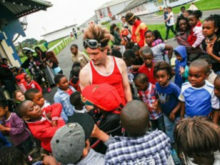 In 2012, Clowns Without Borders South Africa and Clowns Without Borders France went to South Africa to perform 9 shows for 2500 migrants living in slum buildings. 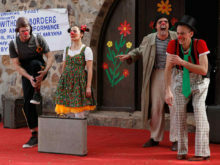 In 2012, Clowns Without Borders Ireland toured in Ireland to perform 4 shows in refugee centers, for 300 asylum seekers. 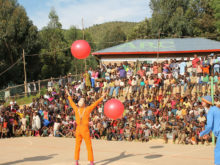 In 2012, Clowns Without Borders Ireland went to Rwanda with the help of the UNHCR, to perform 8 shows and workshops for 800 people. 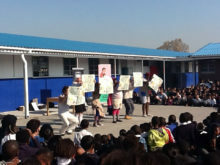 In 2012, Clowns Without Borders South Africa performed 10 shows for 5000 people in Durban. 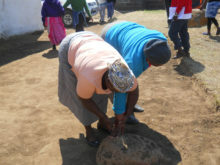 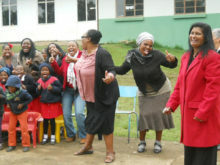 In 2012, Clowns Without Borders South Africa toured in South Africa (especially in Cape Town) to do a baseline assessment for a big parenting program starting in 2013.